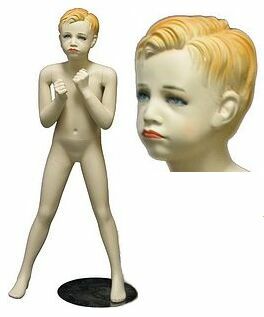 Child mannequin with makeup, molded hair. This mannequin is great for displaying children's clothing line, toys and much more. Detachable arms, hands and torso make them easy to dress. Dimensions: Height - 48"; Chest - 23"; Waist - 21"; Hip - 23". Color: fleshtone.